Close-up of a leaf with late blight. The whitish fungal growth is characteristic. Look for it early-morning while the relative humidity is high. Note the lesions on the leaves. Stems and fruit show evidence of late blight. Cause Phytophthora infestans, a fungus-like microorganism that also attacks potato (Irish, not sweet). It usually does not survive in soil or dead plant debris. For an epidemic to begin in any one area, the microorganism must overwinter in potato tubers (culls, volunteers) or be reintroduced on seed potatoes or tomato transplants, or live spores must blow in with rain. Besides potato and tomato, P. infestans can infect only a few other, closely related plants. Occasionally peppers and eggplants are mildly infected, as are a few related weeds such as hairy nightshade (Solanum sarrachoides) and bittersweet nightshade (Solanum ducamara). It is a common problem west of the Cascade Range. Since 1990, there have been severe outbreaks of late blight in commercial and home garden plantings of potato and tomato in both the United States and Canada. Many have been associated with new strains of the late-blight microbe. 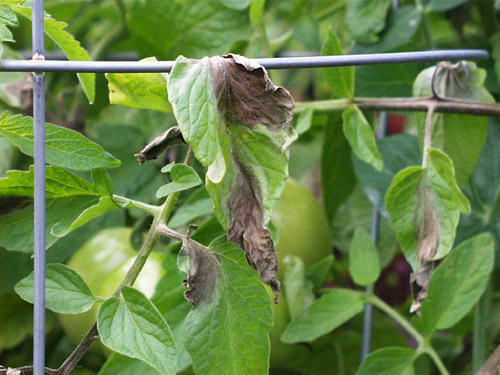 Late blight of tomato is a disease that progresses very rapidly. Cool, wet weather favors disease development; hot, dry weather checks it. Infected stems can harbor the pathogen in dry weather, enabling sporulation and late-blight spread when wetter conditions return. Rainy weather, fog, and dew are favorable for late blight. No commercial cultivars have sufficient resistance to P. infestans to slow disease development, and once disease begins, cultural controls may fail to slow its development. Chemical control, initiated before disease begins, is the only method that can prevent complete crop destruction. Symptoms Lesions start as irregular, greenish, water-soaked spots on leaves, petioles, and/or stems. Under cool, moist conditions, spots rapidly enlarge to form purplish black lesions. Lesions can girdle affected stems, killing foliage farther out. During periods of high humidity and leaf wetness, a cottony white mold usually is visible on lower leaf surfaces at the edges of lesions. In dry weather, infected leaf tissues quickly dry up, and the white mold disappears. On green fruit, gray-green water-soaked spots form, enlarge, coalesce, and darken, resulting in large, firm, brown, leathery-appearing lesions. If conditions remain moist, abundant white mold will develop on the lesions, and secondary soft-rot bacteria may follow, resulting in a slimy wet rot of the entire fruit. On ripe fruit, lesions have cream-colored concentric zones, which eventually coalesce and affect the entire fruit. Cultural control Cultural controls alone won't prevent disease during seasons with wet, cool weather. However, the following measures will improve your chances of raising a successful crop. Plant only healthy-appearing tomato transplants. Check to make sure plants are free of dark lesions on leaves or stems. If starting transplants from seed, air-dry freshly harvested seed at least 3 days. Destroy volunteer tomatoes and potatoes routinely by cultivation or herbicides. Do not let volunteers grow, even on compost piles. Infected tomato refuse should be buried or bagged and put in the trash. Avoid wetting foliage when irrigating, especially in late afternoon and evening. Space, stake, and prune tomato plants to provide good air circulation. Tomato cultivars Mountain Magic, Wapsipinicon Peach, Matt's Wild Cherry, and Pruden's Purple had high levels of resistance to multiple races of the late blight pathogen in trials conducted by University of Wisconsin-Madison while the cultivar Legend, developed by OSU, was resistant to one race of the three pathogen races tested. 'Plum Regal', 'Defiant', and 'Iron Lady' also appear to have resistance to late blight. Some cherry tomato cultivars (Red Cherry and Sweetie) were more tolerant to late blight in WSU trials. Management in Organic Production Control of tomato late blight is dependent upon the combination of cultural management practices and limited fungicide use. It is imperative to use pathogen-free transplants. Choose, if possible, tomato varieties with resistance to multiple races of late blight; several heirloom varieties are available. Growing tomatoes under plastic or in glasshouses will reduce the environmental conditions required for infection, namely moisture on leaves. Keeping greenhouse temperatures warm and providing good air circulation will make the environment less conducive to late blight infections. Consider row orientation in larger plantings in the field. Select fields where winds enhance drying of the plants or have shorter dew periods. Apply irrigation water to the soil, not the foliage. Because late blight can overwinter on volunteer potato or tomato as well as weedy solanaceous plants, it is imperative that volunteers and nightshades be controlled in organic production. Discovery of late blight nearby or within a planting would call for protective spray measures as well as removal and destruction of infected plants or plant parts. Application of fixed copper with an acceptable labeling for organic use can offer protection against the oomycete that causes late blight; however, copper accumulates in soil. (See "Materials Allowed for Organic Disease Management" in Section 5.) The biocontrol material, Serenade, suppresses late blight and in rotation with copper has resulted in marketable fruit even in the presence of active late blight pressure. Rotating out of solanaceous hosts for three years will help to avoid copper build-up as well as populations of other pathogens that affect tomato. Interplanting tomatoes with other crops may aid in decreasing spread once an epidemic commences. Chemical control Spray at regular intervals. Begin chemical control programs before symptoms appear. CAA-fungicide (Carboxylic Acid Amides) formulations (Group 40) as a tank-mix with a fungicide with a different mode of action. Do not make more than two (2) sequential applications before alternating to a different mode of action. Forum at 6 fl oz/A (non-staked plants) on a 5- to 10-day schedule. Do not apply within 4 days of harvest. 12-hr reentry. Ariston at 1.9 to 3 pints/A on 7-day intervals. Preharvest interval is 3 days. 12-hr reentry. Bravo Ultrex at 1.3 to 1.8 lb/A on 7- to 10-day intervals. May be applied the day of harvest. 12-hr reentry. Echo 720 at 1.38 to 3 pints/A on 7- to 14-day intervals. Preharvest interval is 0 days. 12-hr reentry. Copper (Group M1) products are not recommended as stand-alone materials. Badge SC at 0.75 to 1.8 pints/A and 0.5 to 1.5 Tbsp/1000 sq ft in greenhouses on 3- to 10-day intervals. Preharvest interval is 0 days. 24-hr reentry for greenhouse use; 48-hr reentry for all other applications. Cuprofix Ultra 40D at 1.25 to 3 lb/A on 5- to 10-day intervals. 48-hr reentry. Kocide 2000 at 1.5 to 3 lb/A or Kocide 3000 at 0.75 to 1.75 lb/A on 5- to 10-day intervals. 48-hr reentry. Curzate 60DF (Group 27) at 3.2 to 5 oz/A on 5- to 7-day intervals only in combination with another protective fungicide. Do not apply within 3 days of harvest. 12-hr reentry. Dithane DF Rainshield (Group M3) at 1.5 to 2 lb/A or Dithane F-45 Rainshield at 1.2 to 1.6 quarts/A. Do not apply within 5 days of harvest. 24-hr reentry. OSO 5% SC (Group 19) at 3.75 to 13 fl oz/A on 7- to 14-day intervals will suppress disease. Can be applied the day of harvest. 4-hr reentry. Phosphorous acid-based products (Group P7) are labeled for use and are very effective; some are available for home garden use. Alude at 1.25 to 2 quart/A on 7- to 14-day intervals. First application at transplant or when direct seeded crops are at 2 to 4 true leaf stage, then at 1- or 2-week intervals as required to control disease. 4-hr reentry. Presidio (Group 43) at 3 to 4 fl oz/A on 10-day intervals in combination with another fungicide that has a different mode of action. Preharvest interval is 2 days. 12-hr reentry. Ranman (Group 21) at 2.1 to 2.75 fl oz/A on 7- to 10-day intervals. Do not make more than three (3) applications of Ranman before alternating for three intervals to a labeled fungicide with a different mode of action. Preharvest interval is 0 days. 12-hr reentry. Ridomil Gold Bravo SC at 2.5 pints/A. Do not apply within 5 days of harvest. 48-hr reentry. Aftershock at 5.7 fl oz/A is labeled for late blight suppression. Do not apply within 3 days of harvest. 12-hr reentry. Cabrio EG at 8 to 16 oz/A or at 8 to 16 oz/100 gal spray volume (dilute). Preharvest interval is 0 days. 12-hr reentry. Evito 480 SC at 5.7 fl oz/A. Preharvest interval is 3 days. 12-hr reentry. Flint at 3.8 fl oz/A. Do not apply within 3 days of harvest. 12-hr reentry. Quadris Flowable at 6.2 fl oz/A. Do not apply with an adjuvant. May be applied the day of harvest. 4-hr reentry. Reason 500 SC at 5.5 to 8.2 fl oz/A. Do not apply within 14 days of harvest. 12-hr reentry. Premixes of fungicides are available and offer ease for fungicide resistance management. Do not make more than one (1) application of a Group 11 fungicide before alternating to a labeled fungicide with a different mode of action; for other fungicide groups apply no more than two (2) sequential applications alternating with another fungicide with a different mode of action.Orondis Opti (Group M5 + 49) at 1.75 to 2.5 pints/A on 7- to 10-day intervals. Do not apply more than two (2) sequential applications. Preharvest interval is 3 days. 12-hr reentry. Dexter Max (Group M3 + 11) at 0.8 to 1.1 lb/A on 7- to 10-day intervals. Preharvest interval is 5 days. 24-hr reentry. Dexter Xcel (Group M3 + 11 +3) at 36 fl oz/A on 7- to 10-day intervals. Preharvest interval is 7 days. 24-hr reentry. ManKocide (Group M1 + M3) at 1 to 3 lb/A on 7- to 10- day intervals. Under moderate to severe disease pressure use the higher rate on 3- to 7-day intervals. Do not apply within 5 days of harvest. 48-hr reentry. Orondis Opti (Group M5 + 49) at 1.75 to 2.5 pints/A on 7- to 10-day intervals. Preharvest interval is 3 days. 12-hr reentry. Orondis Ultra (Group 49 + 40) at 5.5 to 8 fl oz/A on 7- to 10-day intervals. Preharvest interval is 1 day. 4-hr reentry. Quadris Opti (Group 11 + M5) at 1.6 pints/A. Do not apply until 21 days after transplanting or 35 days after seeding. Adjuvants should not be used. Preharvest interval is 0 days. 12-hr reentry. Tanos (Group 11 + 27) at 6 to 8 oz/A on 5- to 7-day intervals. Must be tank-mixed with an appropriate fungicide with a different mode of action (non-Group 11 or 27). Do not apply within 3 days of harvest. 12-hr reentry. Revus Top (Group 40 + 3) at 5.5 to 7 fl oz/A on 7- to 10-day intervals. Do not use Revus Top on varieties in which mature tomatoes will be less than 2 inches in diameter. Preharvest interval is one (1) day. 12-hr reentry. Zampro (Group 40 + 45) at 14 fl oz/A for no more than three (3) applications per season. Preharvest interval is 4 days. 12-hr reentry. References Seidl Johnson, A.C., Jordan, S.A., and Gevens, A.J. 2014. Novel resistance in heirloom tomatoes and effectiveness of resistance in hybrids to Phytophthora infestans US-22, US-23, and US-24 clonal lineages. Plant Dis. 98:761-765.